Roasted beets, chocolate cake and a visit to the Green String Farm have all been on my mind for a few weeks. Well I finally accomplished the lot and have assembled them into a scrummy little package just for you. First, can we please talk about the Green String Farm..WOW… what an amazing farm. The boys and I did not want to leave. Between the artistically arranged produce in the farm stand, the playhouse fit for miniature royalty, and the farm animals, it is truly a magical place. I could feel the farm fairies and garden sprites working their magic and sitting on the shoulders of the charming members of the this farm team. Green String Farm was founded in 2003 by Bob Cannard and Fred Cline. Cannard has been farming sustainably for 30 years and providing produce to Alice Waters‘ restaurant Chez Pannise. Cannard is a very important member of the sustainable food movement in Northern California. Fred Cline is the landowner and founder of Cline Cellars. These two pillars of the Sonoma County community were not satisfied with the way the “organic food movement” was evolving. They believe that “organic” should equal; locally grown, include a deep respect for the environment and planet, and products should not be traveling across country or continents to go to market. So they created a new name for their system of farming, Green String Farming. Their method incorporates the above mentioned premises as well as the use of cover crops, soil supplements, such as microbes, compost tea and crushed volcanic rock. At Green String they are doing some really important work. They are also paying it forward by running four internships programs per year, where they teach their cultivation practices to future farmers. It is a farm that I highly recommend visiting. The farm stand is open every day 10 -5. They have been selling produce to the community since 2006. On the day we visited they had an extensive selection of tomatoes, lettuces, melons, pumpkins, apples, pears, prickly pears, celery, carrots, onions, and beets. As I have had this chocolate beet cake recipe brewing in my head I was on the lookout for those rosy, dirt covered, little gems. We choose a couple of pounds of the tiny tender beets. When we got them home and roasted them we had a virtual rainbow of colors, yellow, red and watermelon. Growing up, my childhood best friend’s mother, used to make a chocolate mayonnaise cake for every birthday. I have uber-fond memories of this cake and I have been day-dreaming about reinventing it. This cake uses cocoa instead of chocolate and mayonnaise to replace any eggs, oil or butter. The result is a fine crumb and a moist irresistible tooth. I have been fascinated with the use of beets in chocolate cake. I am not going for a red cake, sorry I never got on the red velvet kick, not my thing. And let’s face it folks I am writing a blog about farms and their produce. My mission is to visit 52 farms in a year, one a week. All the summer fruits are winding down for this year so we are on to our fall harvest. So after much deliberation and researching online because there are quite a few variations on this theme, I think I came up with something …dare I say it…new…ok well maybe just not written about on the internet YET….now here it is…wait for it.. long title…don’t let my long involved title scare you off though… If you are still reading…yay… and thank you and you will not be sorry to try this recipe out. – Place a rack in the center of the oven. Preheat to 375 degrees F.
– Thoroughly wash beets under running water. Place clean beets in a baking dish drizzle with a little vegetable oil and add a couple of tablespoons of water. Cover the dish with foil. Roast beets until tender when pierced with a knife, about 1 hour. – Remove the beets from the oven, allow to cool. Peel and grate. Measure 1 1/2 cups beets for the cake and 1/2 cup beets for the cream cheese swirl. Set aside. – Reduce oven heat to 350 degrees F. Butter and flour a Bundt pan. – Combine the dry ingredients in a mixing bowl: 2 cups all-purpose flour, 3/4 cup sugar, 1/4 cup brown sugar, 1/2 cup cocoa powder, 1 teaspoon baking powder, 1 teaspoon baking soda, 1/2 teaspoon salt. 1/2 cup semi-sweet mini chocolate chips. Stir the dry ingredients together. – Add the following to the dry mixture: 1 teaspoon vanilla, 1 cup half-and-half, 1 cup mayonnaise, and the 1 1/2 cups roasted, grated beets. Mix until well combined. Set aside. – In the bowl of an electric stand mixer place 8 ounces cream cheese, 1/4 cups sugar and mix until combined. Add the egg and vanilla and mix until combined, scrape down the bowl. Add the remaining 1/2 cup roasted, grated beets and mix until just combined. – Place 1/2 of cake mixture into the prepared Bundt pan. Spoon the infused beet cream cheese mixture into the center of the cake batter, trying to stay away from each edge by about 1/2-inch. Pour the remaining cake batter on top. – Bake for 1 hour or until a skewer inserted in the cake comes out clean. Remove cake from the oven and allow to rest for 15 minutes. Invert cake onto a cooling rack to cool completely before applying ganache. – While the cake is cooling prepare the ganache. Heat 1 1/4 cups of heavy cream in a small saucepan to scald point. Place the 1 cup of mini chocolate chips in a bowl. When cream is hot pour over chips and allow to melt for a few minutes. Whisk until mixture comes together and is smooth and silky. – Place the cooling rack with the cooled cake on it on top of a clean sheet pan. Begin to pour the ganache over the bundt cake to cover completely. You can reuse the ganache that falls on to the sheet pan underneath if necessary. – Sprinkle the very top with mini chocolate chips for garnish. Tierra Vegetables is actually one of the first farms that I visited after moving to Santa Rosa. On my initial visit a couple of years ago, the farm stand was right on the side of the road in a small, yet friendly wooden structure. Evie, one of the farm owners, was there with her wonderful customer service skills, helping a regular with some recipe ideas. Since then Tierra has re-erected a revived barn, moved from what used to be called the Luther Burbank Center for the Arts. It seems that next to the old barn at its original location there was a beautiful persimmon tree, so it seems fitting that the beautiful orange fruit was what drew me to the barn on this occasion. The family has been at this location since 2002 and in the Northern Sonoma County area for over 30 years. They grow an amazing assortment of vegetables and some of the most delicious strawberries. They are probably most well know for their chiles and sweet peppers. They grow over 30 varieties and make at least that many flavors of hot sauce as well. They have a CSA program, a Farm stand that is open every day but Monday, and they sell on Saturday’s at the Ferry Plaza Market in San Francisco. I follow them on Facebook, so when Evie posted last week that she had persimmons at the farm stand. I hi-tailed it over there. The persimmons are of the Fuyu variety. 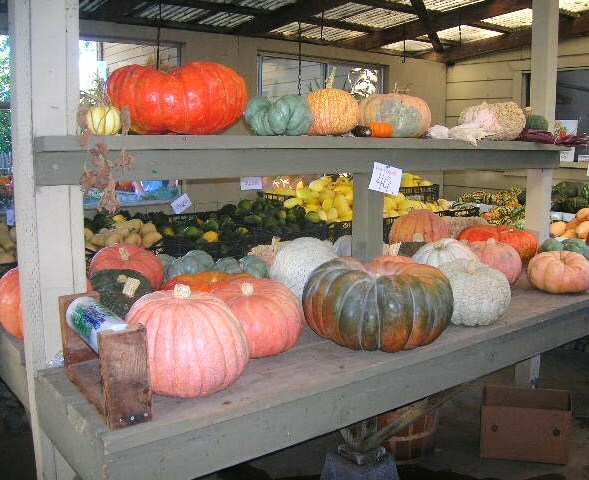 The are grown at their Chalk Hill Farm location in Healdsburg. Also available at the stand right now are potatoes, chiles, peppers, winter squash, celery (which believe it or not is a really hard to find product at a farm stand), kohlrabi, and many types of winter greens. They even have the last of the tomatoes and strawberries a couple of days ago…But that was before the first freeze of the season that we have had for the past two nights. Autumn has finally set in and we are all getting ready for Thanksgiving. The persimmon is a sure sign of the Autumn season. The orange globes with their smooth skin and honeyed flesh. I am discovering that most people are not sure what to do with this fruit. My grandma has been making a bundt cake out of the Fuyu variety for years. I took her recipe and after a little research I realized it was a much circulated version from the California Fuyu Growers Association. I tweaked it a bit. Adding brown sugar and also the addition of currants. Instead of a bundt I made these into whoopie pies. I filled them with a candied ginger mascarpone cream. -Prepare sheet pans with parchment or silpat mats. Preheat oven to 350 degrees F. Blend 2 teaspoons baking soda into the chopped Fuyu persimmons, set aside. -In a large bowl beat the butter, sugar and brown sugar, until light and fluffy. Add eggs, lemon juice and vanilla beat until thoroughly combined. Stir in Fuyu persimmon mix. -Sift together all-purpose flour, baking powder, salt, ground cloves, cinnamon and nutmeg. Stir dry into the Fuyu mixture until just blended. Add walnuts, golden raisins and currants. -Scoop tablespoon sized scoops onto prepared sheet pans. Bake at 350 for 20-25 minutes, until golden brown. Cool on sheet pan 15 minutes, cool completely on rack. -Finely chop the candied ginger. Mix mascarpone and powdered sugar with a mixer. Fold in candied ginger by hand. -After whoopie pies have fully cooled, pipe a layer of the cream on one side of each whoopie pie. Finish by sandwiching another whoopie pie on top. I am looking so forward to spending my first “stay-at-home” holiday season in Sonoma County. I have been working full time for the past two years in the retail food biz…read…not much time off…I think last year I actually worked on Turkey Day itself. So my sister, her family and my brother are coming to spend the holiday here with us. I am excited to take them to some of the farms I have discovered and gather our holiday feast from our local bounty. I wish you all the peace and joy of the season. Take some time out from the hurried pace. Stop and smell the celery and onions sauteing with some fresh sprigs of sage or that fresh Sugar Pie Pumpkin baking in the oven…Give thanks for wherever you are on path at this moment in time! The Crane Melon Barn and the Crane family have a long rich history in Sonoma County. Richard Hope Crane was the first of the Crane’s to arrive back in the gold rush days. He settled on the current land and built the all redwood Crane Barn in 1868. 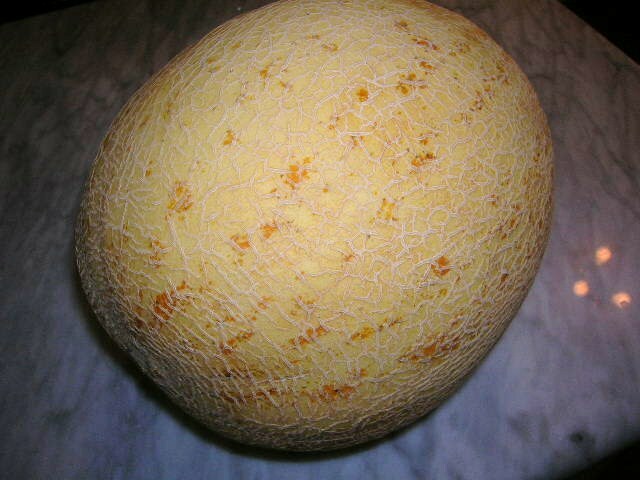 His son Oliver Crane developed the Crane melon by crossing four different melons, Japanese, white, Persian and Ambrosia. He began selling the melons out of the barn in the 1920′s…and people have been visiting the Crane Melon Barn and enjoying these wonderfully sweet and aromatic melons for over 80 years. The farm is currently owned and operated by Richard and Jennifer, 5th and 6th generation Crane stewards of the land. These melons have a fairly short season. They are in season from September through October. But please call the farm first to make sure they are open and available. You will rarely find these melons in conventional markets due to the fact that they are vine ripened and do not travel well. The Crane melon is unique to Sonoma County and a heirloom variety. Slow Food includes the Crane as the only melon variety in its “Ark of Taste”. When we visited the farm last week we were having our (hopefully) last punch of hot weather, it was over 100 degrees here for a couple of days. The first thing that greets you is the perfume permeating the air with a sweet ripe fragrance. On the far side of the barn sits a large mound of teardrop shaped yellowish orbs. They are picked in varying stages of ripeness. As it had been so hot the melons were over ripening on the cool floor where they are on display. I asked the very nice lady manning the store to help me choose a perfect one. She asked if we were going to eat it today or tomorrow. As I was planning on making sorbet on that hot day we choose a ripe, fragrant and slightly soft to the touch melon. I was a pastry chef for many years and Crane melons never crossed my path before. It is definitely not something you would cook. It is probably best eaten fresh and sliced right from the skin, as my 2 year old would attest to. As I was chopping the fruit up and processing it in the food processor he was telling me “no mama… no mama, I want some more”. It is amazing what children want to eat when they visit the farms and see where the fruits and vegetables actually come from. I decided to make a simple Crane Melon Sorbet. Again probably had something to do with the fact that it was 103 degrees on the day we went out to the barn. The sorbet was garnished with pomegranate seeds. Now I have to confess a digression here. The pomegranates are from a tree in my back yard. YAY! for fruit trees in our backyard! Make simple syrup. Place water and sugar in a small saucepan bring to a boil and let boil for two minutes. remove from heat and cool. Prepare your melon. 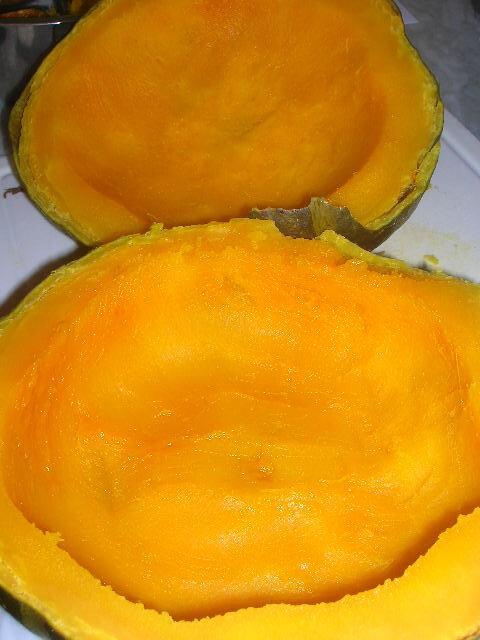 Wash outside, cut in half, remove seeds and peel. Chop the melon into large chunks. Process the melon in a food processor until smooth. Add to the melon puree, cooled simple syrup (to taste) depending on the sweetness of your melon, you may need less syrup. Add lemon and tangerine juice, salt and zest. Chill at least three hours in the refrigerator or overnight. Process in an ice cream maker according to manufacturer’s instructions. We garnished with fresh pomegranate seeds and refreshed ourselves on a very hot Indian Summer afternoon here in the Valley of the Moon. As all of us in Sonoma County are anxiously awaiting the ripening of the Gravenstein apples.I am thinking back to early April when we had the apple blossom spectacular all over West County. I was lucky enough to visit the Devoto Family Gardens in Sebastopol at the height of the blossoming season. Devoto Gardens was started by Susan and Stan Devoto in the 1970’s. Stan is the apple guy. The farm has over 50 different varieties of apples. The Devoto orchards are all dry farmed. Which means that just the natural moisture present in the Sebastopol fog collects on the leaves and is absorbed into the tree, this also makes the roots go very deep in search of natural water. They also grow flowers; Sweet Pea, Cosmos, Dahlia, Tuberose and Sunflowers and a few vegetables; San Marzano tomatoes and lettuces. The Sweet Peas are all grown in a hoop-house. Sweet Peas are my favorite flower! You truly have not lived until you have been in a 300 foot long hoop house with solid Sweet Pea blooms…ah heaven! Alongside the apples and flowers sits seven acres of Pinot Noir grapes. Jolie Devoto Wade arranged to meet with me the day before she was leaving with her husband Hunter Wade for their honeymoon. Jolie is such a joyful and generous spirit. She grew up on this farm and has a real love and a deep understanding of the land. As the only child of the three Devoto family girls to spread her wings and fly and then return to work at the family business. I am sure she stopped packing to show me and my son Ben around the farm. Jolie and Hunter started selling their Apple Sauced Cider last year. It is a delicious hard cider produced from 100% Gravenstein apples.. They have some really inspired ideas about apple combinations for future blends. So delicious! Jolie & Hunter developed a cider using 100% Sebastopol backyard fruit to raise money for the “Save the Gravenstein” campaign. This is a program supported and organized by Slow Food Russian River. This apple farm and cider making is truly a test of patience. They have taken on a new big risk this spring, they planted a new orchard of apple trees just for their cider business. Apple trees need at least five years to see if the trees will produce and then hope that it is a flavor profile that you can work with. Jolie and Wade are sure to deliver us wonderful Local Cider in many varieties for years to come. The Apple Sauced cider profile was so full and ripe that it was perfectly suited to be the star player in the dried fruit poaching liquid. Dried apples, apricots, cranberries, Flame raisins and a few figs. Poach them all gently in the Apple Sauced Cider, which has been slightly reduced with the addition of a cup or so of simple syrup. Rolled the drained fruit up in filo dough. Bake until crispy and golden brown. Serve with Candied Ginger ice cream and the Apple Sauced cider sauce reduced even further of a drizzling sauce. Life, my friends…has a way of twisting and turning and I have been bound and determined to trust in the unfolding. I have been working on transforming my own personal front and back yards into a sustainable vegetable garden, built on permaculture ideas. Take a peek at Kitchen Garden Path. I have had a realization….my blog is a seasonal blog! Not sure if I have ever read another seasonal blog…but you are reading one now. I considered blurring the issue with different subjects and alternate posts. But I have decided to stay true to my original idea of Sonoma County Farm Desserts. Which was always to visit local farms, find the best, most interesting seasonal item, buy it, bring it home and create a dessert to share with you. When I started down this blogging path, I naively envisioned endless months and posts of fruit and vegetable dessert possibilities. My mind never really grasped the true meaning of a seasonal blog. I understand the word in the cooking sense but I never have looked at it or really stood in a farmers shoes and considered the real meaning. Not too say that I have gotten close to understanding what it is like to be a farmer. But I definitely have a new appreciation and understanding of seasons, especially the seasons of Sonoma County. As the rains made their way upon our shores, the farmers rushed to harvest the last crops of the season that could not withstand the heavy rains. Their stories are many and widely varied with the personal details however the plot remains the same…The tender and fragile vegetables and fruits of summer and autumn are gone. We are now left with a hearty breed that can withstand our mild but frosty winter climate. The Brassicas and and the apples, potatoes and squash that have been stored away waiting for their turn at the market. I will still be baking over this winter season, testing out recipes to share with you. If I come across an item which has me full of inspiration I will post about it. So keep following me and I might surprise you with a post when you least expect it. The farmers markets are taking their last late autumn breath of cool crisp morning air and the local farm stands have shut down for the winter season. The farmers have turned over their fields, harvested all but the heartiest of vegetables and planted their cover crops. The soil is ready to be regenerated and rest for a while… a very important part of the sustainable cycle. As my family prepares for the holiday season we are taking stock of our year and counting our many blessings. We are teaching our children that the Holidays are about giving not getting. And we have been taking this time to work on many holiday projects and crafts. May you be enjoy the hugs and smiles of your friends and family!